Chicken Tortilla Soup (and Pupusas!) – Elly Says Opa! This is not your mama’s grilled cheese and tomato soup. I don’t like tomato soup. To me, it’s just so boring and so bland. I need something in my soup, whether it’s meat or a starch or…something. And in general I am not crazy about tomato based soups. I much prefer stock and cream based. Of course, most people would disagree with me and think I’m crazy for not loving America’s favorite soup. Not to mention, there are so many people that absolutely love the combination of grilled cheese and tomato soup. Unfortunately, I was never one of them. Not that I don’t love grilled cheese…but I’ll take mine with fries, thankyouverymuch. 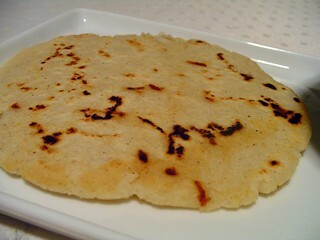 I started to think of what I could make to accompany tortilla soup that was sort of grilled cheese like, and came across pupusas–stuffed El Salvadoran thick tortillas. I have plenty of masa to use and love homemade tortillas, so I decided to go with them. For today, I just filled the pupusas with chihuahua cheese. I used this method, although I definitely used more water than a 1:2 ratio to the masa. And, I added a pinch of salt. Next time I’ll experiment a little more with the filling, but overall we really enjoyed them. 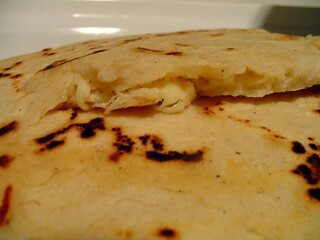 Homemade corn tortillas are so much softer/puffier/more delicious than the store bought kind. In a Dutch oven or stockpot, heat the oil. Sprinkle the chicken with salt and pepper and then brown on each side, about 5 minutes total (chicken will not be cooked through). Remove the chicken, leaving the oil behind. Add the tortilla squares and cook over low heat until they are slightly crisp. Add the peppers, onions and corn and stir until they are coated by the oil. Stir in the garlic, tomatoes, cumin, bay leaf, tomato paste and a pinch of salt; simmer for 10 minutes, stirring occasionally, to combine the flavors and cook the vegetables. Add the chicken broth, chicken breast, and accumulated juices. Bring the soup to a boil and then reduce to a simmer. Simmer for about 20-25 minutes, until the flavors have developed and the chicken is cooked through. Remove the chicken and the bay leaf from the soup. Discard the bay leaf and shred or dice the chicken. 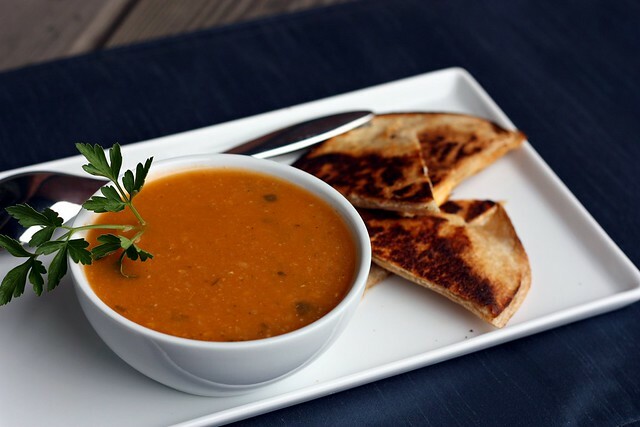 Use your food processor or immersion blender to puree the soup to your desired consistency. Taste and adjust seasonings. 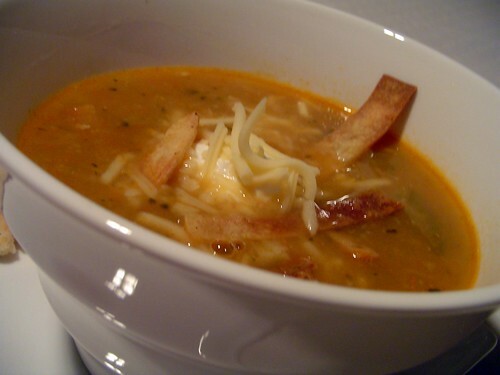 Add the chopped chicken back into the soup, and garnish with your favorite toppings.